Afternoon Loverlies! 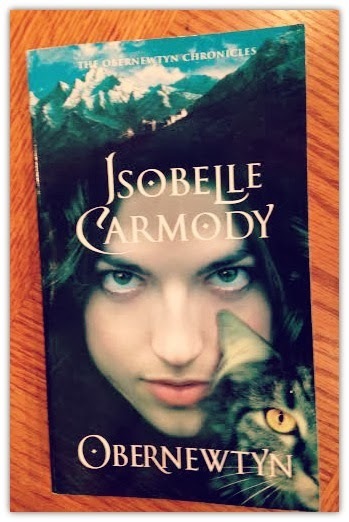 I just finished an interesting book called Obernewtyn written by Isobelle Carmody. This review is not exactly a spoiler but I do talk about a few things you find out in the beginning. Obernewtyn is a story about the world after our technology and computers. The books and herb lore have been banned. These banned items are from what they call the "Beforetime". What happened is there was a nuclear holocaust known as "The Great White". It left areas tainted with radiation. These areas are what they call the blacklands. There are folks that are born with mind powers, they are called misfits. You have misfits from birth or misfits from mischance, when they are from mischance it is because they got into tainted water etc. The people who are not misfits don't associate with misfits, because they want to get their certificate showing they are normal. You are able to find better jobs, living, etc, when you have a normalcy certificate. Whenever you are found out to be a misfit they send you to Obernewtyn to be treated. The main character's name is Elspeth who is born a misfit. Elspeth can speak with animals with her mind along with reading minds and other powers. Since she is a misfit she is sent to obernewtyn to get treated. But there is a lot more going on than being "treated" at Obernewtyn. I found this book a little slow in the beginning. Once it got passed the point where Elspeth goes to Obernewtyn, then is when it started to get more interesting. I love how she can talk to animals with her mind. I sure wish I could do that! I bought the book basically because of the cover and title. I thought the title was very unique sounding and weird, and I love unique and weird. lol I didn't pay attention that it is an 8 book series, whoops! That is alright though I am just going to have to find the rest of the series, because I want to find out what happens. I think it is a decent book to own, and I can see myself rereading these series. If you enjoy fantasy, sci-fi, and dystopian, then give it a try. :) Ta Ta For Now!